One of the many great things about living in Florida is the year-round weather that makes cruising and road trips possible. But, if you or a loved one have a trip interrupted by a motorcycle accident, contact a motorcycle lawyer with 911 Biker Law! Before you put up the kickstand, make sure your bike is ready for the open road. Check All Essential Components: Make sure fluid levels are appropriate, cables are lubricated, and all essential parts of your bike are in working order before leaving. It’s an easy way to avoid an avoidable breakdown during a cruising trip. Adjust The Headlight: Same as the headlights on a passenger vehicle, the headlight on a motorcycle should be cleaned and re-aimed periodically. A properly aimed headlight will expose more of the roadway and be more easily seen by other drivers. Make Sure Everything Is Ready With A Test Ride: Even if you know your bike is ready to go, double check with a test ride before officially leaving. This way if an issue does develop, you’ll be able to make adjustments now rather than during the trip. Tighten The Suspension To Accommodate Luggage: If you’re taking more than one piece of luggage on the road trip, the bike’s suspension should be adjusted to accommodate the extra weight. 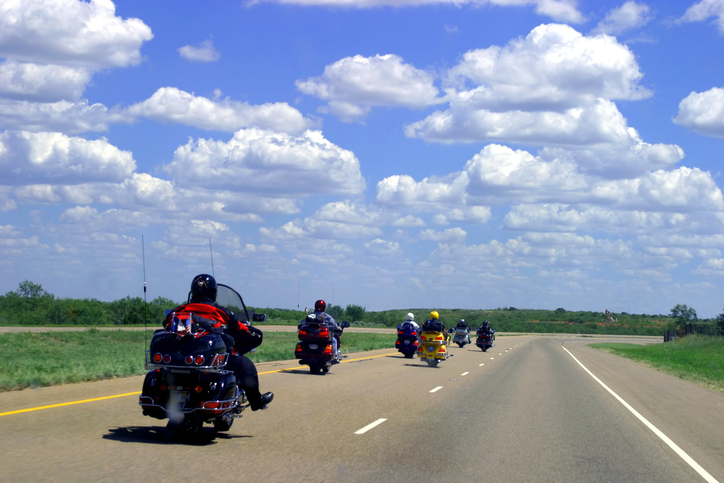 Whether you’re embarking on a scenic Florida road trip or going out-of-state, practicing safe riding is the best way to have a trip you’ll talk about for years to come! If there’s one safe riding tip you’ll hear over and over and over from the Orlando motorcycle accident attorneys with 911 Biker Law it’s this: always wear a helmet. The risk of a head injury — or worse — in a motorcycle accident isn’t worth it. Remember to pack cool neck wraps and sunscreen for hot and/or sunny days. Drinking and riding is just as dangerous as drinking and driving a passenger vehicle. And if you begin to feel sleepy while riding, find a rest area to recharge. Riding while fatigued is as dangerous as drunk riding — both affect your ability to react to changing situations around you. Any accident attorney will tell you defensive riding is important whether you’re cruising in Orlando or taking a long road trip. Defensive riding includes riding with the headlights on at all times; always signaling in advance of lane changes and/or turns, and not staying in a driver’s blind spot more than is absolutely necessary. A long playlist from your favorite band can be counted as a must-have for any cruising trip but so are these items you don’t want to leave without. Sure, smartphones have GPS and map applications built-in, but what would you do if you’re in an area with little to no cell phone reception? Portable GPS systems utilize batteries and rely on satellites to show you the open road. Or, pick up an old-fashioned paper map or road atlas before you leave in case the batteries run out. Basic first aid kits come in compact sizes perfect for stowing on your motorcycle for any trip. If you’re cruising anywhere, remember to have plenty of water for you and a passenger at all times. Dehydration affects cognitive faculties such as reactions and may lead to an accident. A tire kit should have a CO2 tire-inflation system and/or a small pump to patch up a flat enough to get you to the nearest repair shop. If you work on your bike at home, pack the tools you use the most as just-in-case items. No matter the type of traffic area, if you’re involved in a motorcycle accident, call the Orlando motorcycle accident attorneys with 911 Biker Law! The first time you sat on a motorcycle you likely noticed the seat gave you a higher viewpoint than a passenger car. Use this to observe those around you, including pedestrians. Are other drivers checking their cell phones — tsk, tsk — or turning their head to see if the other lane is clear to pass the vehicle in front of them? If you can predict their next move before it’s made, you will be better equipped to protect yourself and your bike. Because other drivers are nothing if consistently unpredictable, it’s a good idea to have an exit strategy when riding through heavy traffic areas. Look around for potential open spaces such as bike lanes and median strips and position yourself so they can be quickly accessed in an emergency. One way to make sure you’re ready to use an exit strategy at any time is to always keep your bike in gear with the clutch engaged when sitting in traffic. This isn’t always possible before leaving on a road trip but if it is, take advantage. Learning a little bit about the traffic patterns, peak travel times, and other tidbits of information about the route can mean the difference between a relaxing trip and one traffic headache after the other. Cruising along open highways can lull even the most experienced rider into a sense of complacency. Yet, many motorcycle accidents happen on corners for many reasons, including not reading the road ahead. Ride at a safe speed and look ahead for changing road direction. This is a good way to avoid needing to contact a motorcycle injury lawyer with 911 Biker Law during your road trip. Obviously being involved in an accident while cruising is one of the worst things that can happen on your trip. But running out of gas along a desolate highway and waiting hours for another vehicle to pass is another. Top off your bike’s gas tank if you’ll be riding through a rural area where gas stations — and other drivers — may be few and far in between. Riding in rural areas can provide memorable scenic views but also leave you with little shelter options when the skies open up. Make sure to be aware of the weather at all times and periodically check forecasts. Look ahead at your planned route for the day and decide whether the distance in between will have shelter options if the weather turns. The vast majority of cruising and road trips are uneventful and memorable for the right reasons. But if yours was marred by mishap, contact an accident attorney in Orlando, FL, with 911 Biker Law. Our law firm defends your rights as a motorcyclist and fights for the full amount of compensation due to you. Call us today.